WE ARE DOING WHAT OTHERS CAN NOT! RUDGORMASH - is a specialized enterprise that designes and manufactures equipment for the mining industry. A group of companies Rudgormash is an only complex supplier of mining equipment. To our customers we offer drilling, mineral-processing and underground mining equipment which is basically a part of all those production processes involved in mining. RUDGORMASH – is a No 1 manufacturer in Russia in order of quality and service. The enterprise was established in 1939. We have a huge experience of supplies. For the last 20 years we have sold and delivered more that 500 drilling rigs, over 1000 self-propelled mine cars, and over 3000 items of mineral-processing equipment to 700 mining companies on the territory of the former CIS. Among those are Metalloinvest (Lebedinski GOK, Mikhailovski GOK), NLMK (Stoylenski GOK), Severstal (Olkon, Karelski Okatysh, Vorkutaugol), Eurazholding, Alrosa, Uralkalii,SUEK, Mechel, UGMK-Holding, Norilski Nikel, SDS-Ugol, Apatit AO, Khakassvzryvprom, Yuzhuralzoloto, Polus Zoloto, Pervaia nerudnaia companiya, Nacionalnaya nerudnaya compania, Gorevskyi GOK and etc. We know how much our equipment means to our customers and we guarantee quality of every and each item we sell. The engineering idea fulfilled in the product is closely connected to the technological opportunities of the manufacturing equipment and the sophisticated technology of production. Along with the manufacturing tools and devices designed and licensed by the enterprise, the manufacturing technique allows to produce highly-accurate and complicated details and units at the same level as the world’s leading manufacturers of similar equipment. Rudgormash company is certified with the international certificate of quality management ISO 9001:2008, which allows us to compete successfully on international market. Our sales managers not only except your orders. Knowing it ALL about equipment they will offer you an ultimate solution taking into consideration your agenda and environment. Our equipment is on the12-month guarantee and we can consider an extended warranty as well. The durability of steel construction highly surpass that of our competitors. We have secured a unique production technology since 1986. Our equipment keeps its functional ability up to 20 years. The drilling rig is completed with high-grade units made by the leading manufacturers which speaks of their reliability. Your thoughts – our professional implementation! Our own design office is a large part of Rudgormash group of companies. It is the powerful engineering bureau. We understand that your technologies and your concerns are specific, therefore we design and manufacture our equipment upon an individual technical requirements for you to have a perfect instrument for achieving your personal and business goals. You have an opportunity to create your ideal drilling rig. Thus our engineers are working for you and with you absolutely free! Use this! Cost-effective exploitation and maintenance, especially in post warranty period is guaranteed due to standardization of the main units and mechanisms. Laconism of the construction makes it simple for the mine mechanics to maintain and adjust the equipment during its work thus reducing six-months hold-ups waiting for the imported spare parts to arrive to merely a couple of weeks. The cost o spare parts is by 30% lower than those of a similar foreign equipment. We manage to keep the prices low due to the operational excellence and sales management. We do not promise you the lowest of the low prices, however we can offer you at a reasonable price the products that will contribute to your future success. Order fulfillment on a challenging timetable. We give no impossible delivery schedules! But we always meet the dates that has been set! Discounts and flexible payment terms. Discounts by total volume, personal bonuses and sales for our loyal customers are in store for you. Variable payment conditions – from 100% advanced payment to partial or 100% deferred payment. We are open for discussion! Mounting and commissioning works, operational adjustment of units and system parts, default management, personnel consultations and on-time parts delivery. Guarantee and post-guarantee services. 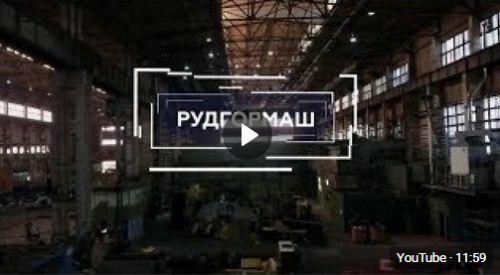 Stuff training to the upper level of competence regarding operation matters, the maintaining and repair works for the equipment produced by Rudgormash. Due to high reliability of the equipment, the geographic proximity of the manufacturer and low cost of spare parts, the operating costs of Rudgormash are considerably lower than of the similar foreign models. MAKE THE PERFECT QUALITY OF YOUR PRODUCTS TO BE YOUR MAJOR COMPETITIVE ADVANTAGE! AND WE WILL HELP YOU WITH THAT!